This past weekend marked the third anniversary of the Irish in the American Civil War blog. Sincerest thanks to all of you who have read articles on the site over that time, to those who have taken the time to comment, contribute and share your knowledge, and also to those who have contributed guest posts. Creating and maintaining this site is one of the most enjoyable experiences I have had, and along the way I have been very fortunate in making some great acquaintances both in the U.S. and Ireland. Many of you will have noted that I have become consumed- to an ever-increasing degree over recent months- by the lives of the ordinary men, women and children impacted by the war. The poignancy of many of their stories, told through documents such as census returns, widow’s pension files, wartime memoirs and newspaper articles is often very difficult to read and can be even harder to write. I normally spend quite a number of hours each week looking at these cases. I find it hard to do this type of research without being deeply affected by it. Somewhere along the way this has developed into an extremely strong feeling of responsibility, bordering on obligation, to tell as many of these people’s stories as I can. Perhaps this has grown out of the fact that their stories have been largely forgotten in Ireland. Interest in their history was ‘left at the port’ when they emigrated. Many are only represented as numbers used to demonstrate the depopulation of this country during the Famine and it’s aftermath, their later lives are thus decoupled from their experiences in Ireland and by extension become almost an irrelevancy in the story of Ireland’s history. This realisation has grown hand-in-hand with a rising despondency about the continuing failure of the Irish Government to take serious steps to acknowledge the effect of the American Civil War on the hundreds of thousands of Irish people in America (and indeed a wider lack of serious recognition of the history of the Irish diaspora worldwide). It would now seem that the sesquicentennial may slip by with no serious efforts to commemorate any of these people in Ireland. I find this is all the more poignant when one considers that many Civil War soldiers took special efforts not to forget the people at home, even when facing the prospect of imminent death themselves. The blogging world can take you down some unexpected paths. One the completely unexpected outcomes of setting up the blog was the invitation last year from The History Press Ireland to write a book based on some of the stories covered in it. I was delighted to take them up on the offer, particularly as only a few months previously some portions of the site had been plagiarised, one of the risks inherent in putting research up on the internet. The plagiarism in question appeared in a self published book (which you can see here) that contained a number of posts directly lifted from the site. Everyone who starts publishing material on the internet knows that such an occurrence is a possibility, and there is little that can be done about it- however in my view the rewards of blogging more than outweigh the risk. The work in question is no longer available from the major online bookshops, and in the meantime as a result of that History Press offer I have had an opportunity to publish in book form some of this work myself. 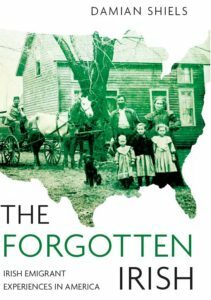 My book, titled the Irish in the American Civil War, came out towards the end of February and I am delighted to say it has already sold out. It is currently the subject of a reprint which will be completed by the end of this month. Many thanks to all of you who have already purchased it (I hope you enjoyed it!). It has received excellent coverage on a number of national radio stations (including RTE Radio One, Newstalk and Today FM) and also positive reviews in national newspapers such as The Sunday Times and The Irish Independent. It seems to be having a positive effect on raising the profile of the conflict in Ireland. One drawback is that the book is not as yet available on bookshelves in the United States; we are currently seeking publication options there and hopefully this can be rectified in the coming months. The site has also brought me the opportunity to present a number of talks about the American Civil War around the country (you can seen an example of one of these presentations here). As anyone who knows me is aware, I love to prattle on about historic topics, none more so than the Irish in the American Civil War. I find that these talks often present opportunities to reach a different audience to those who read the blog. It also provides a forum to champion the case for greater awareness of the conflict and highlight the huge number of people from individual localities who were affected by the war, which in turn can heighten a sense of connection with those who emigrated in the nineteenth century. This is also something a number of colleagues and I (Robert Doyle, James Doherty and Ian Kenneally) are trying to achieve through the Irish American Civil War Trail initiative. One other major benefit this site has bestowed on me is an increased knowledge of social media, its applications and its potential. When I sat down at my computer three years ago I had only the vaguest idea of what a blog was. The intervening years have taught me to fully embrace the potential of the internet and social media as an educational tool; it is undoubtedly the most powerful form of mass communication available to us today. I have been able to bring the lessons learned at Irish in the American Civil War to other blog sites I have set up that focus on heritage businesses and community heritage projects (by the way if you are interested in any of them, they are the Rubicon Heritage Blog, Bere Island Heritage Project, Midleton Archaeology & Heritage Project and the Know Thy Place Blog). Perhaps the most significant lesson of all though is a simple one. I have discovered that I love the writing style that blogging engenders. Blogging can be all things to all people. There are no rules as to how you write, or to how many, or indeed few, writing conventions you choose to adhere to. Having written many papers in refereed and academic publications over the years (and such publications have their value and their place), I have found in blogging an opportunity to try to write in an engaging style for a general audience while still trying to be rigorous in the use of referencing. It is perhaps not the most usual of blogging styles (and can certainly be a bit time-consuming), but I hope it allows the site to stand up more as an educational resource. Blogging also allows you to mix and match; thus I try to combine the personal story aspect of the site with a strong resource component for those interested in the Irish in the American Civil War, with pages providing more detailed information on aspects such as Books, the Medal of Honor, Generals and Regimental Nativity. Over the past three years this site has been a central part of my life, and I imagine and hope that it (and the Irish experience of the American Civil War in general) will remain so for many years to come. If it were possible I would quite happily spend all of my time researching and telling the stories of the Irish in nineteenth century America, but alas I have to be contented with a few hours at evenings and weekends. For those of you who read this blog, thanks for coming along on the journey so far, and for helping to make it so much fun! Many thanks! If you do make it over be sure to let me know! For those of you who havent already, you should check out Ron’s excellent blog at http://dclawyeronthecivilwar.blogspot.ie/ which consistently has some great stuff. It made it through this time! Many thanks- I know the ordinary individuals are also central to your own research on the subject, there is something all the more fascinating about them. There are many worse ways to spend time than exploring their stories! Thanks for the comment, and many thanks for that incredible letter you shared relating to Colonel Byrnes. It illustrates that the view he had when he discussed his situation with Father Corby continued to persist right up until he received his mortal wound. The work you are doing on the Noyes letters is fantastic, and it will be a travesty if you don’t manage to get them published, they deserve to be read by a wide audience. Have you had any further success in that direction? I agree with you, Damian. Your book has been greatly enjoyed and appreciated by me, and I hope that you, Brad, are able to do the same with your work. Both of you fellows have excellent blogs. If I may ever be of further service,please let me know. Really interesting story thanks for sharing it! Many thanks for the comment and the kind words- I am in complete agreement with you! I hope the work on the 23rd Illinois is going well, I look forward to hearing more about them! Many thanks for the kind words! I agree with your sentiments entirely and thanks for your continued reading (and interaction) with the blog! Many thanks for your fine work over the past years. With your effort, I was able to discover that my great-grandfather contributed $1.00 (no small sum in the 1860’s) to Irish relief. I hope at some point I will be able to obtain your book. Many thanks for the comment and I am delighted you were able to find that out about your great-grandfather!